Learning may be the ultimate preventative medicine. Adapt to cognitive stress with joy, curiosity and fierce optimism and health follows. My writing on learning design can be found here. Wellness is not an afterthought or a salvage process but a source of high-value individual and group learning. A sensitivity to environment and an arts background allows design to enhance the experience of learning to be uplifting and inspirational. Any development project should enhance the wellness of its community. At the Still Point, highlighted below is an example of a project designed to engage and highlight the need for wellness practice. From Winter Whispers, the vibrant and liminal works investigating the intersection of mind, trauma and perception by artist-architect Janine-Opal featured in the Still Point. question can art and music sustain challenging health care practices? listening Having just lived through residency and medical school, respectively, Dr. Matthew Wetschler and I chose to investigate the increasingly challenging and emotionally draining professional experience that most doctors, residents, and students were having. Although the pressure to see more patients in the context of managed care presents a huge challenge to the professional experience, there were also aspects of the culture, gained through the rigorous and coercive training that was compounding the difficulties faced by care takers. The data surrounding physician burnout, suicide, reduction in satisfaction, and desire-to-work corroborated the stories we were hearing. Approach Initially conceptualized as an homage to the wonder and awe to be found in medicine, through lively discussions with patients and providers, and a desire to support care-takers, the Still Point underwent several design iterations: First a multimedia dance work, then a community web publication then, with the realization that the principles were committed to direction interaction with each other and their audience, a concert tour. We hoped the tour would support mindful and reflective cultivation of individual voice and shared artistic experiences. We wanted to create an experience that offered sanctuary for participants, offering the time for reflection and art as one way to reconnect to their own experience without judgment or critique. We chose to focus on raw, in-person, and participatory performance. The show consisted of the stories of a patient and a provider, each told through their words and paintings accompanied by an improvised musical score. The concert concluded with a sound painting, essentially a cooperative game where the audience becomes an orchestra that creates the sound environment of a hospital before uniting in song and breath. Outcome Response has been overwhelmingly positive. The Still Point asserts that, in our media drenched world, our minds need time and space for non-judgmental interactions. Neuroscience shows us that a large part of our mind expresses itself and understands the world though emotional and other non-verbal means and by overemphasizing our rational and verbal side we fall out of balance with real health consequences. 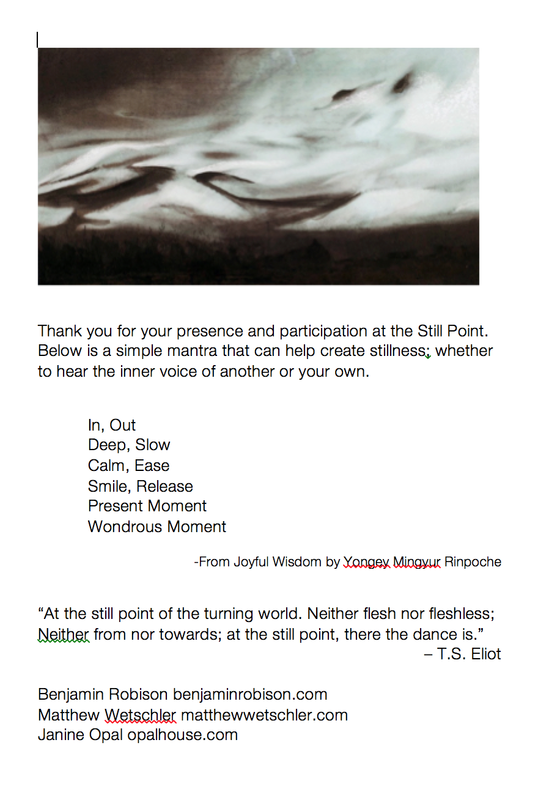 The Still Point tour is a healing meditation in word, music and light dedicated to the inner landscapes of patient and provider. It offers a shared empathetic experience and points to opportunities for a mindful practice. More than that, it offers a truly interactive art experience, as the audience becomes the musicians. "Thanks so much for your visit with the medical students today and your fabulous performance at the Harvard Ed Portal this evening. During our lunchtime meeting, the medical students heard your message loud and clear regarding burnout, self-care and resilience through the arts. This evening, the mixed audience of caregivers, educators and community members were transformed by your music and Matt's words." Poesis by Matthew Wetschler. Together with the series It's Hard Loving you Closely, these works explore the extremity of experience in a hospital emergency department. Featured work in the Still Point. The key goal of this project was to set an example of vulnerability and exemplify the cultivation of time and safe space necessary to cultivate one’s inner voice. The nationwide tour including stops at Stanford, Harvard, Yale, and UNC, Meadows School of Music, Dallas, continues. Post concert survey's support the impact of the project on participant inspiration to engage in further mindful practice.